WILLIAMSPORT, Pa. - After a last-minute loss to King's in 2013, the 23rd-ranked Lycoming College football team will be looking for a measure of revenge on the Monarchs when they enter David Person Field on Saturday, Sept. 20. The Warriors (2-0 overall, 1-0 MAC) are coming off an impressive 26-0 win over Albright on Sept. 13. The defense allowed just 114 total yards and six first downs to the Lions en route to the 68th shutout in the 41-year tenure of defensive coordinator Steve Wiser. The defense also forced three turnovers. The Monarchs (0-2 overall, 0-1 MAC) fell in a defensive battle to Stevenson, 7-0, on Sept. 13. Senior Tyler Hartranft completed 15-of-28 passes for 186 yards, but threw two interceptions in the game. • With 33 career touchdowns scored (30 rushing, three receiving), senior Craig Needhammer is two touchdowns shy of the school record of 35 set by Tim Dumas (1996-99). • Needhammer leads the MAC in rushing touchdowns (4) and rushing yards per game (116.0). 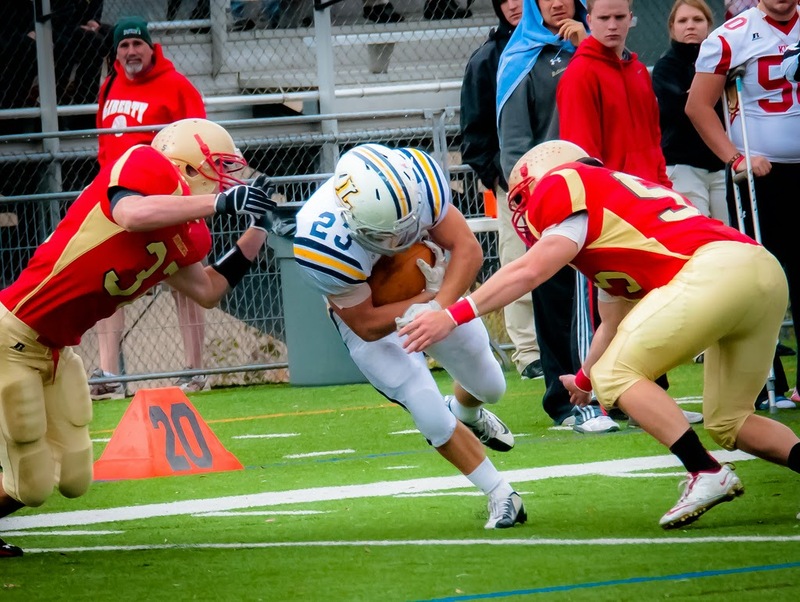 • Senior John Sibel needs one more reception to become the 18th player in school history to reach 80 in a career. • Through the first two weeks, the Warriors are ranked seventh in Division III in scoring defense (6.5) and ninth in total defense (187.5). • Lycoming is 37-21 (.638) all-time on Family Weekend, including wins in each of the last four contests. • The Warriors have won their last seven games at David Person Field, the most since an eight-game stretch in 2007-08. The Warriors enter the week with the Middle Atlantic Conference's top scoring offense at 34.0 points per game after posting 42 against Susquehanna and 26 against Albright. The Warriors are second in the league with a 158.22 passing efficiency, as senior quarterback Tyler Jenny leads the MAC with a 0.640 completion percentage. He is also second in the league in passing yards per game at 221.5. Senior Craig Needhammer also tops the MAC in rushing, averaging 116.0 yards per game, while his four rushing touchdowns also lead the league. Junior Ryan Umpleby is one of two receivers amongst the league's top 10, sitting second with 198 yards while senior John Sibel is seventh at 116 yards. Through the first two games of the 2014 campaign, the Warriors have again posted staggering defensive numbers. They are currently seventh in the nation in scoring defense (6.5) and ninth in total defense (187.5).The squad is also 10th in passing yards allowed (98.0), 10th in 3rd down converstion percentage (0.400), 19th in passes intercepted (4) and 21st in red zone defense (0.400). Three Warriors are in the top 10 in the MAC in tackles for loss, with senior Jimmy Nottingham fifth with 1.8 per game while senior Braden Zeiner and Brian Campbell are each tied for seventh at 1.5 per game. Zeiner is tied for third in the league in sacks at 1.0 per game. Campbell and junior Matt Malecki lead the team with 13 tackles each, while senior Zack McMenaminhas added 11. Junior Mike Gentile leads the team with two interceptions. King's enters the game ranked eighth in the MAC in scoring offense (7.0), fourth in total offense (318.0), fourth in rushing offense (121.0), and fourth in passing offense (197.0). King's quarterback Tyler Hartranft has completed 32-of-65 passes, throwing one touchdown and five interceptions. His favorite target is Preseason All-American Dan Kempa, who is second in the MAC with 6.0 receptions per game and fourth with 92.0 yards per game. On the ground, the Monarchs will use a pair of tough runners in Patrick Robinson and Kyle McGrath. Robinson is averaging 6.2 yards on 20 carries while McGrath has 61 yards on 20 carries. The Monarchs are ranked fourth in the MAC in scoring defense (20.0), fourth in total defense (302.5), seventh in rushing defense (167.0) and fourth in passing defense (135.5). The King's defense is paced by Bobby Russell, who leads the team with 16 tackles and a sack. Kris Matthews has added 15 stops and both James Burke and Nick Kaigala have posted 14. Michael Martina leads the squad with 2.5 tackles for loss. The defense played well in a 7-0 loss to Stevenson, allowing just 163 total yards and 13 first downs in the game. King's limited the Mustangs to 89 rushing yards and 74 passing yards and the squad also forced two turnovers thanks to interceptions. Senior Craig Needhammer is on the verge of breaking another school record. One week after setting the school's rushing touchdown standard, he is just two scores shy of the school's all-time touchdowns mark of 35 set by receiver Tim Dumas (1996-99). The 5-8, 180-pounder is in full view of several other records as his 12 100-yard rushing games is three shy of the record of 15 set by Brian Thompson (1995-98). With four straight 100-yard rushing efforts, he is one shy of the school record of five straight set by Josh Kleinfelter in 2010. He is also 720 all-purpose yards shy of the school record of 4,474 set by Kleinfelter from 2007-10 and 952 rushing yards shy of Kleinfelter's mark of 3,665 yards. Senior Tyler Jenny is on pace to leave his own distinguished mark on the school's record book. The quarterback has posted a 17-5 (.773) record as a starter, which is tied for the sixth-most wins in school history. In his 22 starts, Jenny has completed more than 60 percent of his passes in 17 games, helping the team to a 15-2 (.882) record in those games. Jenny is the school's all-time leader in completion percentage (62.7) and passing efficiency (144.07). After the 42-13 win over Susquehanna, Lycoming entered the D3football.com Top 25, placing 23rd in the poll, where they remained after the win over Albright. The ranking of 23rd is the highest for the team since being ranked 22nd after the first week of the 2004 season. The 26-0 shutout of Albright on Sept. 13 was one of the most dominating defensive performances during head coach Mike Clark's seven years at the helm. The Warriors allowed just 114 yards to the Lions, which is the third lowest total since Clark took over and the lowest since a 69-yard effort against Misericordia in 2012. For defensive coordinator Steve Wiser, the shutout was the 64th since being promoted to the position in 1977 and the 68th in his 41 years as a Warrior assistant. An efficient performance in the rain at Albright has helped Lycoming College senior Tyler Jenny earn his first career MAC Offensive Player of the Week award while junior Mike Gentile picked off two passes to earn his first MAC Defensive Player of the Week award. Jenny completed 17-of-25 passing for two touchdowns and 213 yards.